This conference is sponsored by the SIAM Activity Group on Geometric Design and in cooperation with ACM SIGGRAPH. The SIAM Conference on Mathematics for Industry: Challenges and Frontiers will follow this meeting at the same location from October 9-10, 2009. Use the navigational buttons on the right side of this page for additional information. Students are encouraged to apply for travel support. Applications deadline for these awards is August 10, 2009. As of January 12, 2009, a valid ESTA approval is required for all Visa Waiver Program (VWP) to travel to the United States. Please visit http://travel.state.gov/visa/temp/without/without_1990.html for additional information and procedures. The previous SIAM GD conferences in this series were held in Tempe, Arizona (1989, 1991, 1993), Nashville, Tennessee (1995, 1997), Albuquerque, New Mexico (1999), Sacramento, California (2001), Seattle, Washington (2003), Phoenix, Arizona (2005), and San Antonio, Texas (2007). Precursors to these meetings were two conferences in Albany, New York (1985, 1987). The previous ACM Solid Modeling Symposia included events in Austin, Texas (1991), Montreal, Canada (1993), Salt Lake City, Utah (1995), Atlanta, Georgia (1997), Ann Arbor, Michigan (1999, 2001), Saarbrücken, Germany (2002), Seattle, Washington (2003), Genoa, Italy (2004), Cambridge, Massachusetts (2005), Cardiff, Wales, United Kingdom (2006), Beijing, China (2007) and Stony Brook New York (2008). The common pre-cursors to these conferences were the workshops held in 1986, 1988 in Rensselaerville, New York and sponsored by the IFIP Working Group 5.2. The SIAM Special Interest Activity Group on Geometric Design and the ACM Symposium on Solid and Physical Modeling have a shared heritage dating back to the early 1980s. This joint conference in 2009 represents a historic union of these communities, their rich academic and industrial histories, as well as the common intellectual themes that continue to move them forward. Over the past twenty years the meetings of the SIAM Special Interest Activity Group on Geometric Design have been one of the main general international conferences on geometric modeling and related areas, and have been well attended by mathematicians and engineers from academia, industry, and government. Since its inception in 1991, the ACM Symposium on Solid & Physical Modeling has been the primary international forum for disseminating research results and exchanging new ideas in relevant mathematical theory, solid modeling, physical modeling, geometric design, analysis, simulation and processing, shape computing and visualization, and various applications. 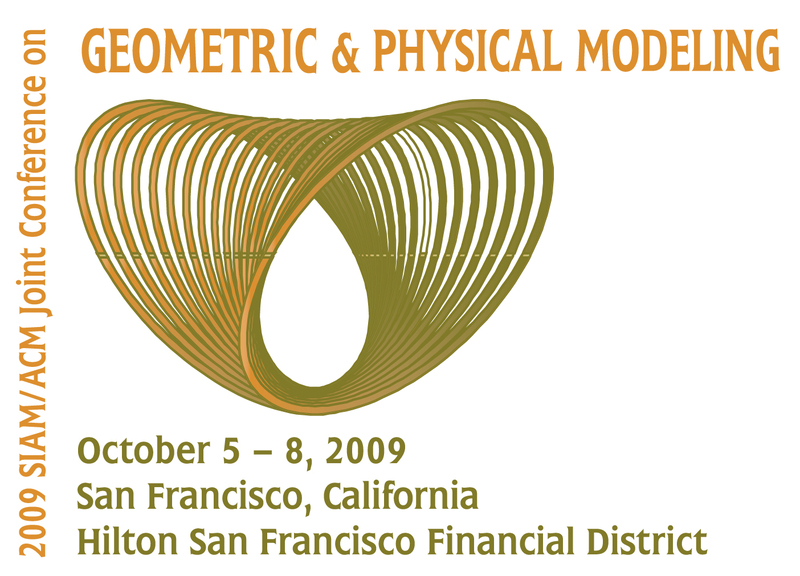 The 2009 SIAM/ACM Joint Conference on Geometric and Physical Modeling seeks high quality, original research contributions that strive to advance all aspects of geometric and physical modeling, and their application in design, analysis and manufacturing, as well as in biomedical, geophysical, digital entertainment, and other areas (see the list of conference topics below). A shared objective of both the SIAM GD and ACM SPM communities is a desire to highlight work of the highest quality on the problems of greatest relevance to industry and science. Use the navigational buttons on the upper right side of this page for additional information.